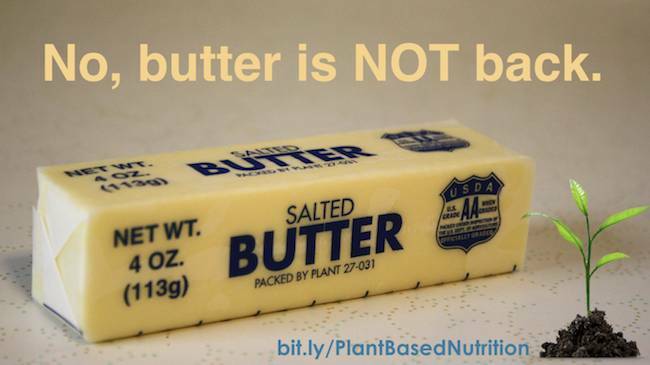 Saturated fat – found primarily in animal products – promotes chronic disease. Still. This is solidly established in the scientific literature. Although recent industry funded meta analyses, designed specifically to confuse and obfuscate the health issues, appear to absolve saturated fat, this does not change the results of metabolic ward, and careful population studies of the past. Rather, they sift, sort and screen the voluminous data and use title, abstract, and conclusion wording to confuse. Hence the refurbished old news that hit headlines once again last week…based on this article, published in BMJ. Yet it was. And, as usual, it captured media attention. Nothing has changed. The preponderance of data demonstrate that eating diets high in saturated fat increases disease risk. The American Heart Association maintains their recommendation to aim for a dietary pattern that achieves 5% to 6% of calories from saturated fat. A whole food, plant-based diet averages approximately 6% to 7% of calories from saturated fat. Adding in one serving of animal products or tropical oils (yes, including coconut oil) easily brings that number to above recommended limits. And it is not just cardiovascular disease that saturated fat promotes. This article by Physicians Committee for Responsible Medicine shows 12 more reasons besides cardiovascular disease to reduce saturated fat. Ignore the headlines. Focus, instead, on the overwhelming evidence in support of plant-based diets for optimal health.